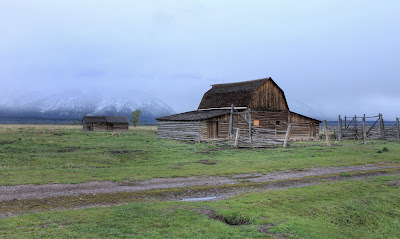 One of my main reasons for visiting the Grand Teton Nation Park area, was to visit "Mormon Row". Besides its history, it is a popular place for photographers. In the late 1800's, leaders of The Church of Jesus Christ of Later-day Saints sent out members of their congregation to establish new communities. 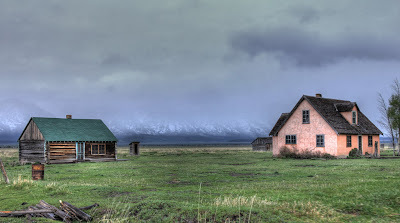 Here, 33 homesteads were established and today only 6 homesteads remain in this ghost town. In 1997, this area was added to the National Register of Historic Places. Click on the picture to enlarge the photo if you wish to read the sign at the entrance. Despite the rainy and overcast weather, I half expected to see some photographers here. But as we arrived, we were the only car there after driving through soggy and muddy puddles. A gate blocked the entrance to the town, so I had to trudge into town through the soggy and muddy puddles just like the old days. I had to admit it was a little spooky roaming the lonely area by myself since my husband decided to stay in the car. The pink house belonged to the Moulton family with a guest house to the left of it and an outhouse in the background. The Moulton Barn is said to be one of the most photographed barns in America. I was hoping to capture it with the mountains in the background like the photograph you see below I found on the internet, but it was not my luck on this dreary day. I read it is best to visit here during late summer, early fall so I hope to come back here some day. As I was about to leave, a number of visitors started to arrive. Because of the extremely small parking area, we had to make room for others. This is a beautiful picture of the Moulton Barn I found on the internet. I wish I could give credit to the photographer, but no name was given, but the photo could be found here. If you are interested in additional history of this place you can read the following articles I found on the internet. With these mountains in the background, I understand it is photographed that much. What a pity you didn't get the photo you wanted! I know that disappointing feeling! It was your third photo that really caught my imagination though. It is a perfect composition and really captures the history and decline of the place. like Emm, I so love the composition in the third photo. I too had several moments like this, where I could barely see the mountains at all. Thanks for sharing this Karen, I did not know about this before, had I known, we could have stopped here and maybe get a clearer picture since it was pretty clear skies when we were there. I too am planning to go back to this place. Amazing looking. The whole place reminds me of Andrew Wyeth's paintings, somehow. I think your photo is nice in a different way and perhaps more interesting than the one you got off the internet. Beautiful series, and what a breathtaking background scenery on the last pic! I've been to the Tetons a bunch but never to Mormon row. It's on my bucket list though. My mother grew up in Dubois, Idaho, a small town where, on a clear day, you can see the "other" side of the Tetons. Some of her sisters married local ranchers. 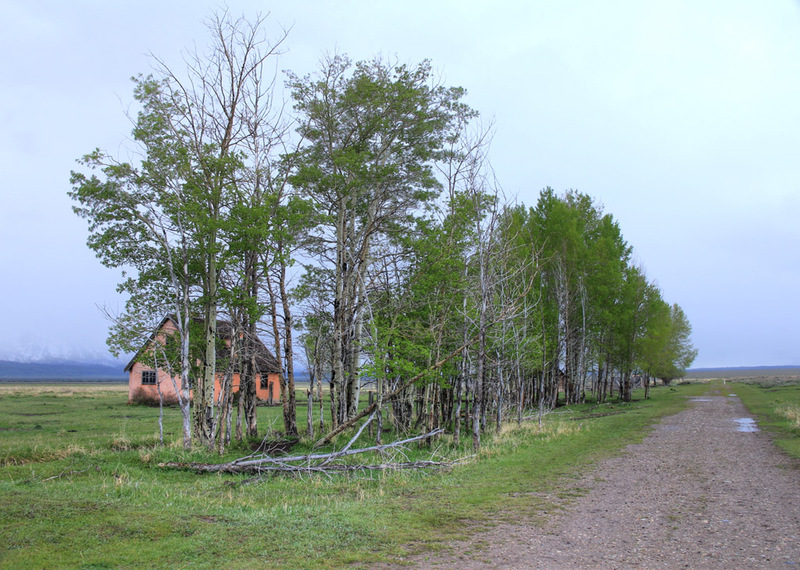 The log type barns are very common but there are less and less of them every year. 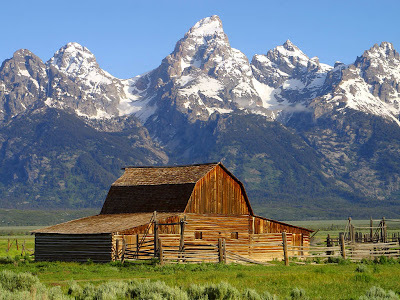 Of course, they had only sagebrush covered hills as a background, not the Tetons in photo you show. I think I would like stay in there, though it is a barn. You captured some nice shots there and thanks for the history. Like Rainfield, I'd love to stay there for a while. It is a spectacular Ghost Town, I imagine it was quite spooky to explore in that grey weather too. The Tetons are stunning, however I like the look of the weather barn surrounded by low hanging clouds barn. A spectacular vista no matter how you look at it. I simply love the third and last picture, there is something so realxing in them...lookslike one amazing trip!